Celebrate the opening of Lab’s revitalized Jackman Field, Saturday, September 15, 10 a.m. and 7:30 p.m. Morning: Cheer on the Maroons! Food trucks will be available during and after the games. After the Varsity soccer game, come play on the field! Parents’ Association will facilitate games and activities for younger kids. 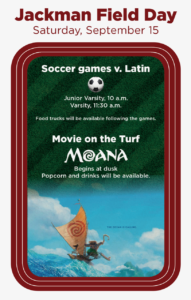 Enjoy a private viewing of Disney’s Moana (rated PG) on the new turf. Bring your blankets and chairs to get cozy. Lab will provide the popcorn and drinks. « Back to School Night for grades 1–2, Thursday, September 13, 6–8 p.m.